The issue of immigration reform is again a hot topic in Washington, with news of a bipartisan Senate compromise proposal to overhaul immigration laws. But immigration is only a middle-tier issue on the public’s agenda, and it has declined in importance since the end of the Bush administration. In the Pew Research Center’s annual policy priorities survey, released Jan. 24, 39% said that dealing with the issue of illegal immigration should be a top priority for the president and Congress. That placed it 17th on a list of policy priorities for the coming year. Six years ago, shortly after the Bush administration’s failed efforts to revamp immigration laws, 55% viewed immigration as a top priority. Since then, immigration has fallen in importance among members of both parties, but the decline has been particularly dramatic among Republicans. Today, just 44% of Republicans view illegal immigration as a top priority, down from 69% in 2007 and 61% as recently as two years ago. Six years ago, illegal immigration was the second-highest priority after terrorism for Republicans; today, it is tied for 12th. 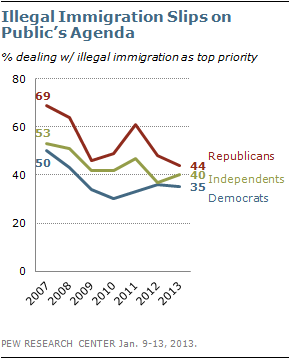 Fewer Democrats and independents also rate illegal immigration as a top priority than they did in 2007. Just 40% of independents and 35% of Democrats see illegal immigration as a top priority, down from 53% and 50%, respectively, in 2007.